Your browser does not support JAVA scripting. Please enable scripting. Quality through experience! 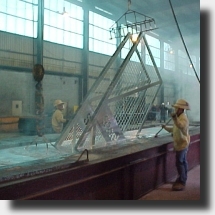 Since 1973 Young Galvanizing, Inc. has consistently provided the highest levels of zinc coating quality as well as service, receiving numerous awards and a reputation for quality within the galvanizing industry. The reason for this reputation is experience. 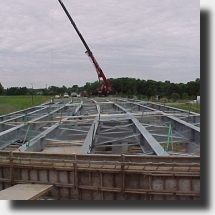 Our managers and foremen all have at least 20 years of experience with our company and a majority of our workforce has more than 10 years each. This cumulative experience adds up to a better product for you. 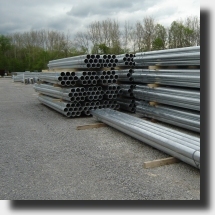 We process a wide variety of products, from small custom pieces to large highway products. Our customer base covers the northeast, mid-Atlantic, southeast areas and extends as far west as Chicago, with our customers products going around the world. Young uses one large kettle that is 48 feet long, 5 feet wide and 8½ feet deep. Our smaller kettle is 24 feet long, 5 feet wide and 6 feet deep. 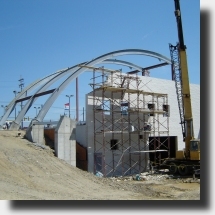 Using a process called "progressive dipping" we can galvanize products up to 90 feet long. Young's own onsite metallurgical engineer is constantly monitoring the kettles to be sure proper levels of additives, including aluminum and nickel, are present in the zinc bath to provide the best possible quality and appearance for your product. 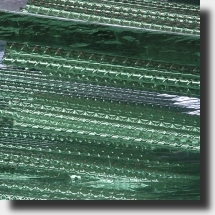 As a long term member of the American Galvanizers Association we meet all ASTM and AASHTO specifications, as well as having access to all the latest information concerning galvanizing. We are located near Interstate 80, 79 and Route 60 in Western Pennsylvania, affording easy access from any direction. We have an easy to find plant with over 10 acres of available storage space. 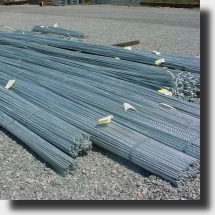 Our large storage lot ensures that your steel will be handled minimally, reducing the chances for damage, so you get a better product. For tips on what you can do to insure that you receive the best finish at the lowest cost click here. Copyright ©Young Galvanizing, Inc. All rights reserved.